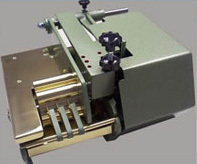 The Gluefast Company, Inc manufactures the Standard Edge Gluer as well as the Top Side Edge Gluer, which are gluing machines designed for the straight line gluing and coating application of an adhesive along the edge of an item. Both machines have an open end (cantilevered), which allows the adhesive to coat the edge of the item to be glued. Built for heavy industrial use and trouble-free maintenance, the Standard Edge Gluer may be exactly what you need to improve the efficiency of your adhesive system. The Standard Edge Gluer from Gluefast glues the bottom edge of an item and is available in our #2 and #4 models. 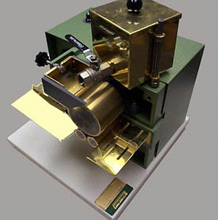 The gluing machine models have the ability to glue up to 2” (5 cm) or 3.25” (8 cm) of an edge of paper, chipboard, corrugated, or wood up to 5/8” (16 mm) thick. Achieve the precise amount of glue required for your adhesive application by adjusting the glue film thickness with the simple turn of a knob. The 120-volt motor comes standard with variable speed control, providing flexibility to work with small pieces to glue. In addition, we also have an optional 220-volt motor available with alternative speed controls.